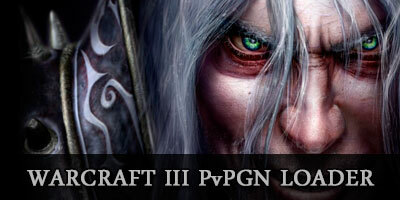 This Loader will allow you to play on PvPGN Servers (Eurobattle.net, Rubattle.net, etc), the Warcraft III PvPGN loader 1.5.1.1 version works with the latest version of Warcraft 3 Patch 1.28 o greater (1.28.5, 1.28.4, 1.28.3, 1.28.2, 1.28.1), 1.27b (1.27.1.7085), 1.27a (1.27.0.52240), 1.26a (1.26.0.6401) or others. – Unzipped the files after you download it. – Copy the files (w3l.exe, w3lh.dll, wl27.dll, latency.txt and readme_w3l.txt) in your Warcraft 3 Folder. – Run the w3l.exe file to start WarCraft III. – Join to Battle.net and select you PvPGN server favorite and connect. For more information and details read the “readme_w3l.txt” file. 1.- Patch Error (Unable to read memory) in some Warcraft 3 versions (1.27a). There was an error patching war3.ese (Unable to read memory). Make sure you are using versionn 1.22a-1.28a. Solution: Try with another loader (Loader 1.4.2.0) and wait for the next update/fix. 2.- “Virus warning”. Some antivirus / firewalls can to display warning messages for w3l.exe file and blocking it, this is probably just false positive by your anti-virus. If your anti-virus blocked w3l.exe file, go to antivirus options, unlock/restore it, and put it on the safe list. – To add PvPGN (private server) servers to Warcraft 3 use the Blizzard Battle.net Gateway Editor utility program. PvPGN (Player vs Player Gaming Network) is a bnet based gaming network server emulation project. It currently supports all Battle.net games (such as StarCraft / Brood War, Diablo II, Warcraft II, Warcraft III: Reign of Chaos and The Frozen Throne), and most Westwood Online clients (Tiberian Sun, Red Alert 2, Yuri’s Revenge). It gives you the power to run your own server, manage your own users, run your own tournaments, etc. – For people who find Battle.net too slow or laggy and want to play on a local server with no lag.